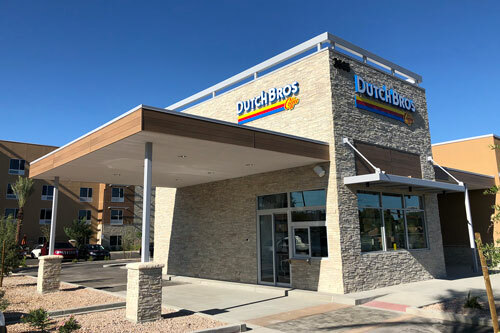 Phoenix, Ariz. (November 29, 2018) – Thompson Thrift Retail Group, a full-service development and construction company, has sold a Dutch Bros Coffee drive-through, located at 3665 West Chandler Boulevard in Chandler, Arizona. Dutch Bros Coffee occupies the property as part of a single tenant, triple net lease. The buyer, a family trust out of California, purchased the property for $2,000,000 in a 1031 exchange. Kidder Mathews commercial real estate brokers, Trask Switzenberg, Chuck Wells, and Darrell DeShaw, represented Thompson Thrift Development in the transaction. “This sale marks the culmination of a project two years in the making. From sourcing the site in early 2016 with our development partner Thompson Thrift Retail Group, identifying the tenant, negotiating the ground lease, identifying the buyer, and facilitating the investment sale,” said Switzenberg. “We are fortunate to have been involved in the project since its inception and pleased to have been able to facilitate a transaction that satisfied the goals for both the buyer and the seller,” he said. Kidder Mathews is the largest independently owned commercial real estate firm on the West Coast, with over 750 real estate professionals and staff in 21 offices in Washington, Oregon, California, Nevada, and Arizona. Kidder Mathews offers a complete range of brokerage, appraisal, property management, consulting, project & construction management, and debt & equity finance services for all property types. The firm performs $7 billion in transactions, manages over 50 million square feet of space, and conducts over 1,500 appraisals annually. For more information, visit kiddermathews.com. Thompson Thrift Retail Group is a division under Thompson Thrift, a full-service real estate development and construction company with offices in Terre Haute, Indianapolis, Phoenix, AZ, and Houston, TX. Thompson Thrift is engaged in all aspects of acquisition, development, construction and leasing of quality retail, office, mixed-use and multifamily projects nationwide. To learn more about the company, please visit thompsonthrift.com.